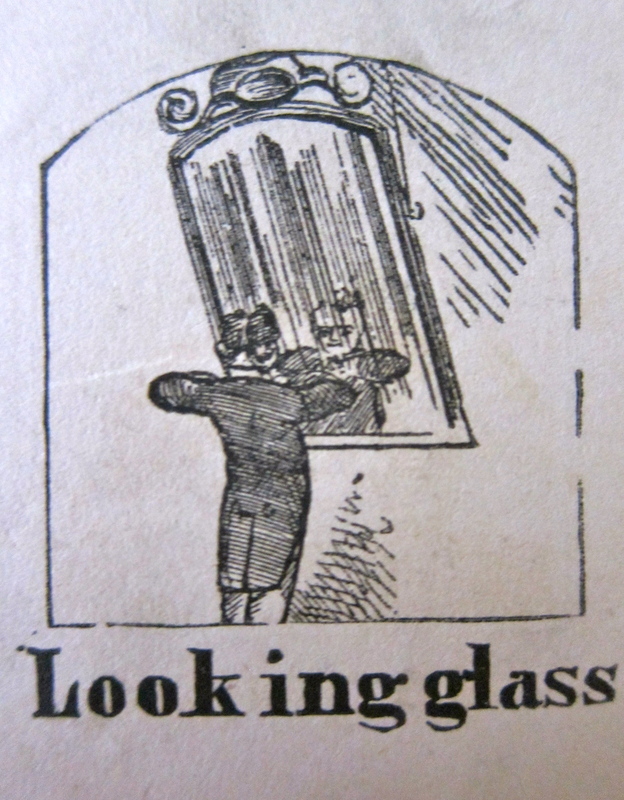 We might call it a mirror, but Evelina and most of her contemporaries called her new purchase a looking glass. (Think of “Through the Looking Glass and What Alice Found There,” Lewis Carroll’s 1871 sequel to his 1865 “Alice’s Adventures in Wonderland.”) Like the framed prints Evelina had recently bought for her walls, the looking glass was a fashionable piece of decor. She must have been tickled to have one hanging in her parlor. New “methods of mass-producing large, flat panes of glass had been perfected and, by combining them with heatless, chemical-coating technologies,”* mirrors had become easy to manufacture – and affordable. At mid-century they became stylish and ubiquitous, symbolic of the new taste and purchasing power of the middle class. In a home like Evelina’s which, 50 years earlier, might have boasted no more than a small, courting-type mirror, a big, new looking glass, hung on braided silk roping from molding above it, had become de rigeur. Other than this exciting upgrade in the parlor, today was a Monday like any other. Jane McHanna did the laundry, Susie Ames washed the breakfast dishes, and Evelina took to her needlework. She was teaching her daughter to knit. *Wikipedia, Mirrors, accessed February 19, 2015.